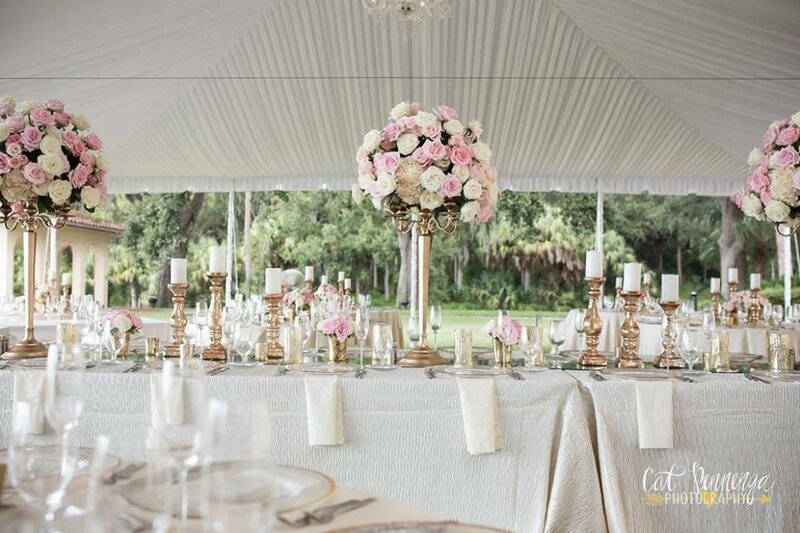 This pink and blush wedding was held at the lovel Powel Crosley Estate in Sarasota, FL. 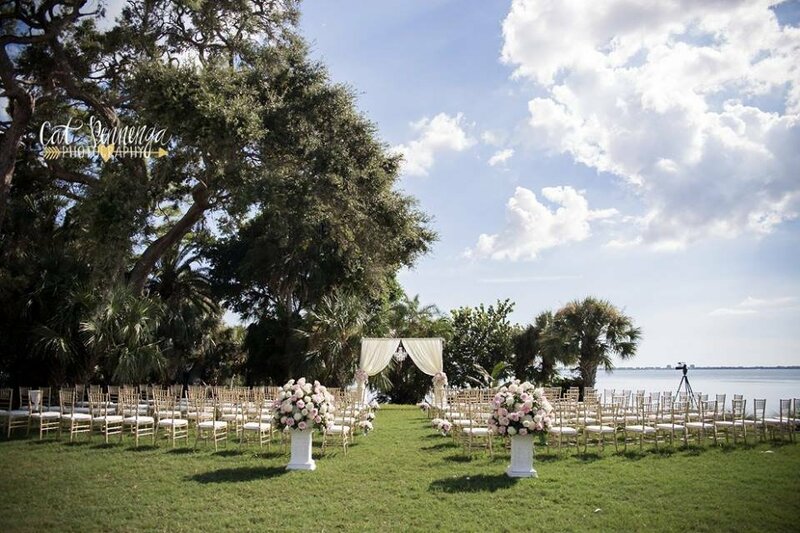 The ceremony itself was on the Crosley lawn on the front corner in order to see the bay…wow! What a view everyone had for this spectacular day! 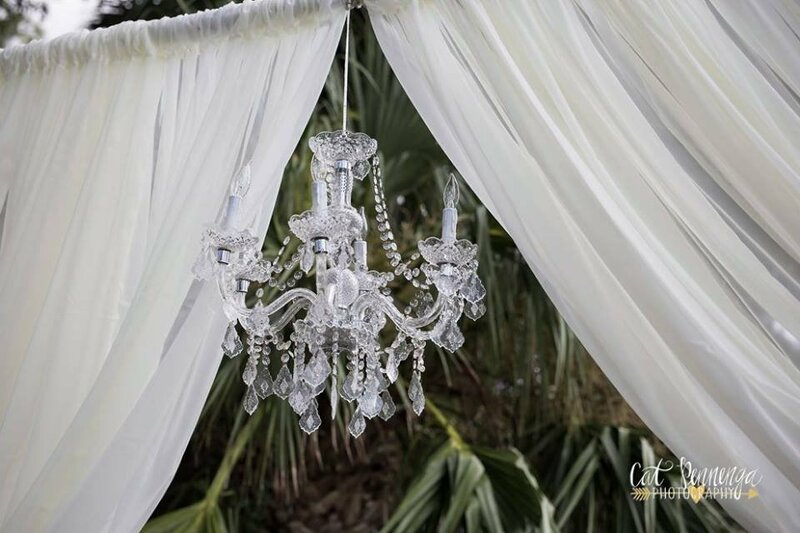 And the reception was held under a big dreamy tent which is always a great way to host to your guests. 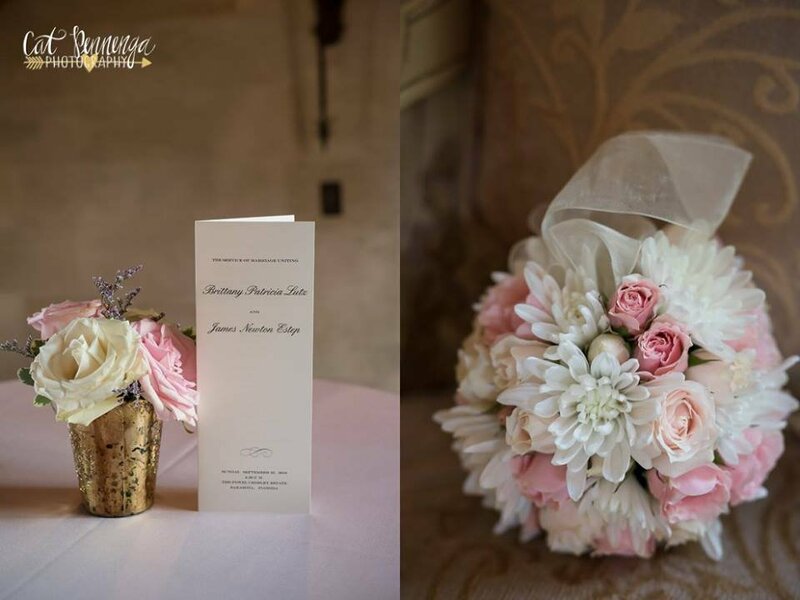 This wonderful bride just loved roses in shades of blush, soft pinks and creams, so we used lots of garden, traditional, and spray roses throughout the floral design. 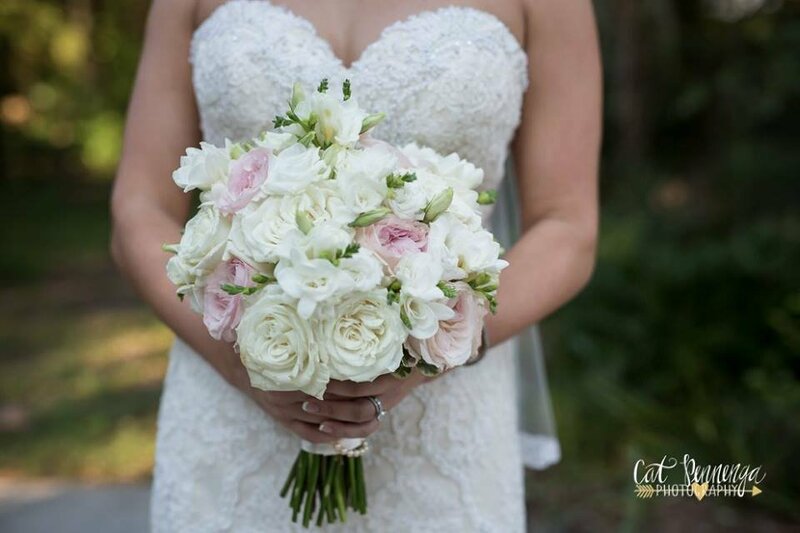 She carried a lovely bouquet of garden roses in pink and cream with freesia nested between—it was so, so pretty! 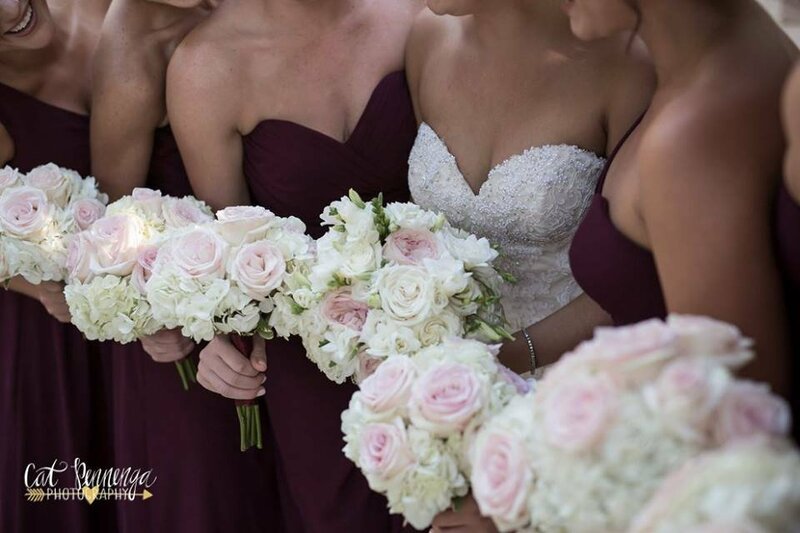 And the bridesmaids carried bouquets of hydrangea with roses nested between, and the little flower girl carried a darling pompadour ball to match, simply exquisite in every way! 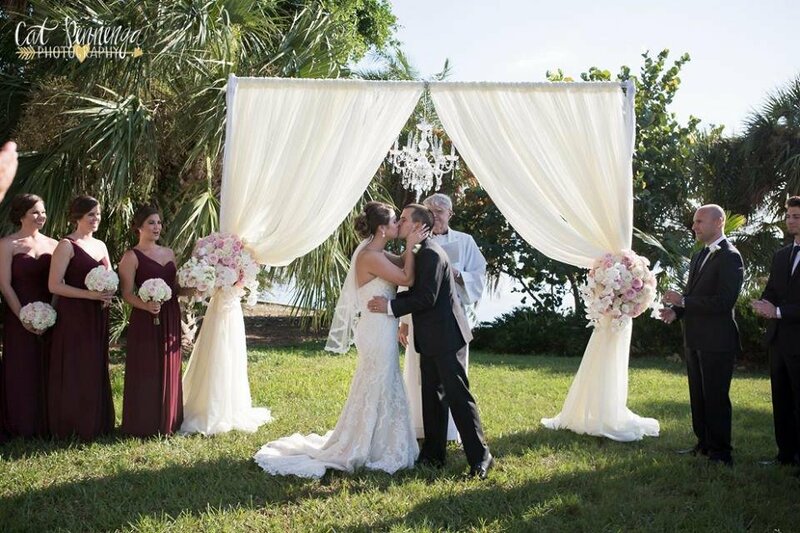 For the ceremony, we provided the arch that had a sheer tied-back fabric along with a gorgeous chandelier from Affairs in the Air in the center and two simply over-the-top floral sprays of all roses which included some trailing Phalaenopsis orchids. Oh my goodness! It was INCREDIBLE! 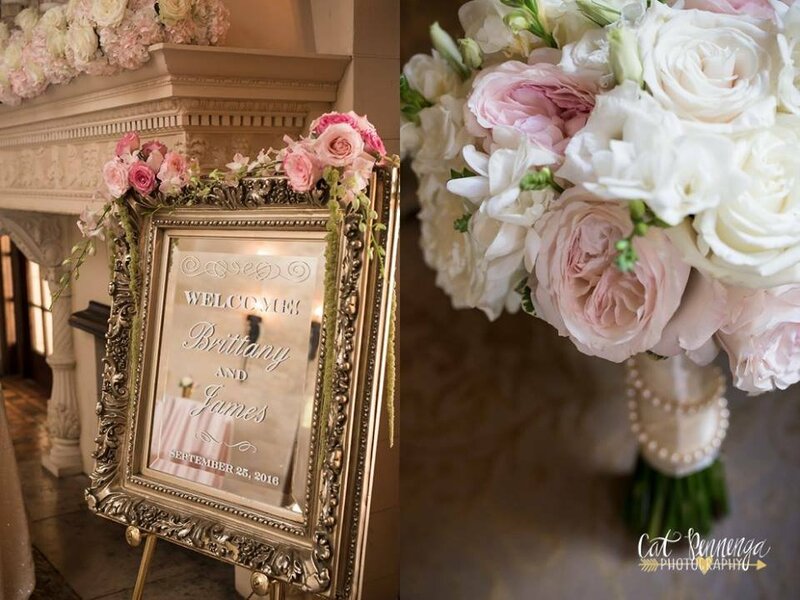 At the back of the aisle, the guests were greeted by 2 stunning rose arrangements on short pedestals. 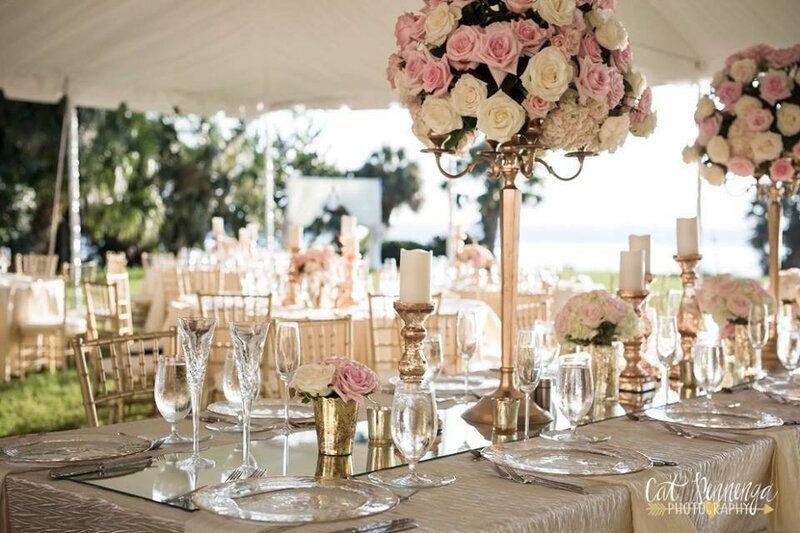 The head table was in the center of the tent with the couple seated at the top of this feasting-style table on a lovely sofa from So Staged Rentals. It was a neat addition to the head table! 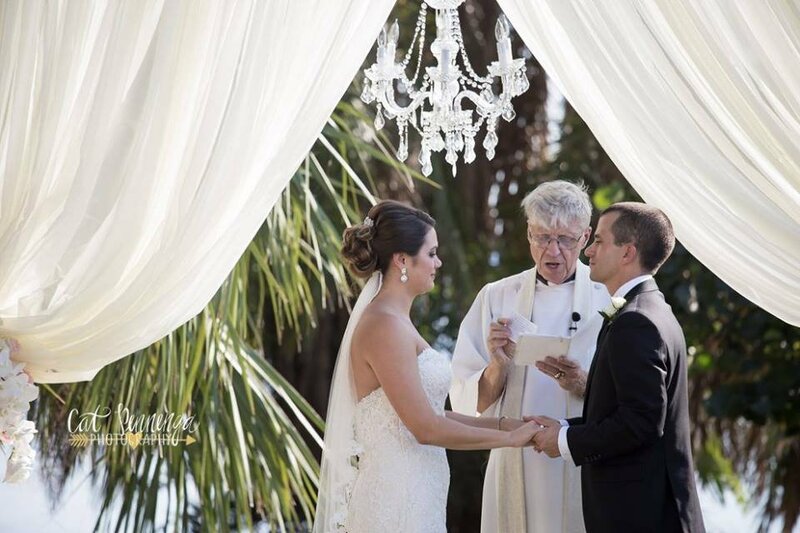 It held 3 of our gold candelabra with additional gold pillar candles running up and down. 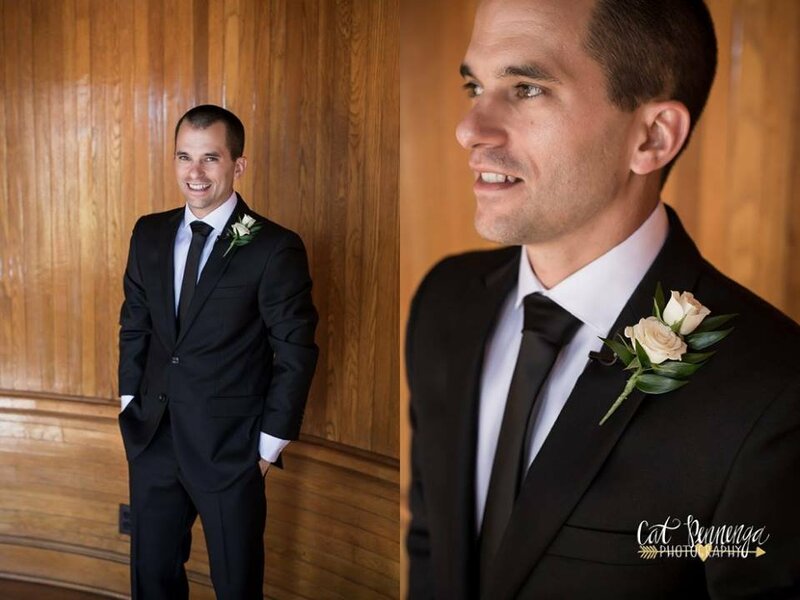 We also used the bridal bouquets nested between. 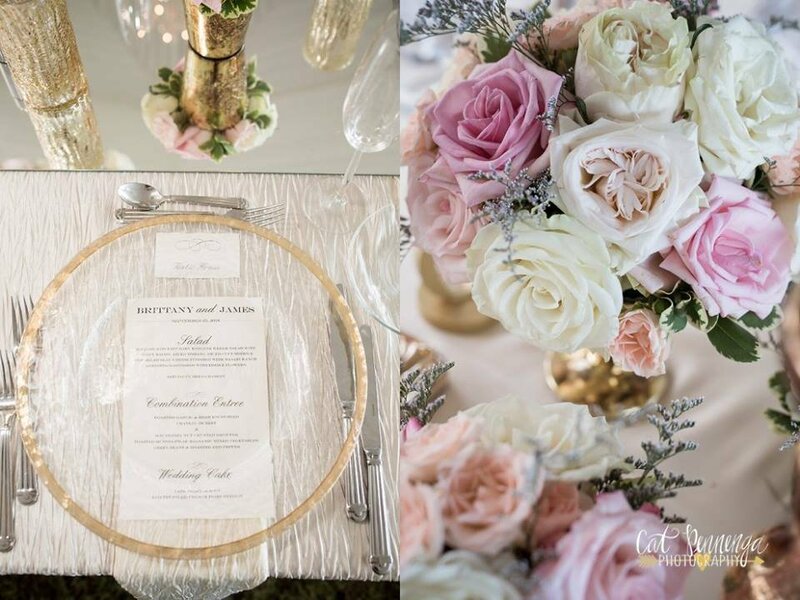 It was such a romantic and pretty table in every way! 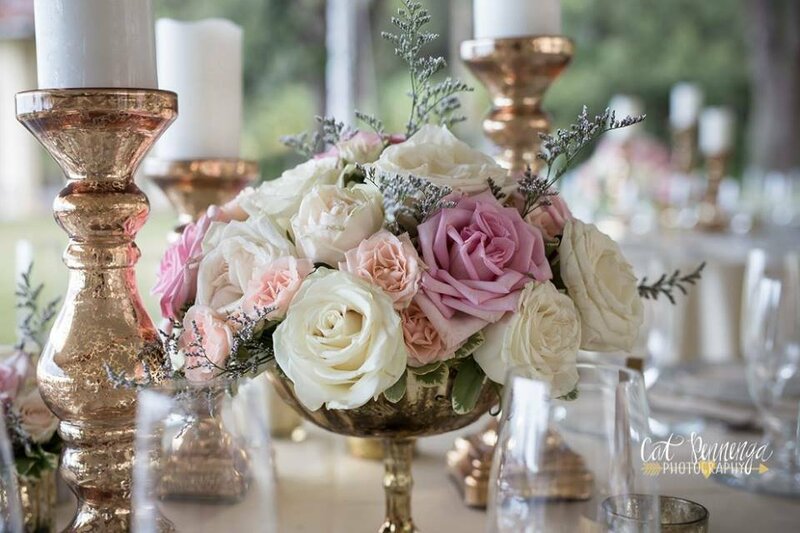 The other guest tables featured our gold footed bowls with rose arrangements and additional gold candles and votives, which we supplied as well. This pulled all the tables together and created a very cohesive look! 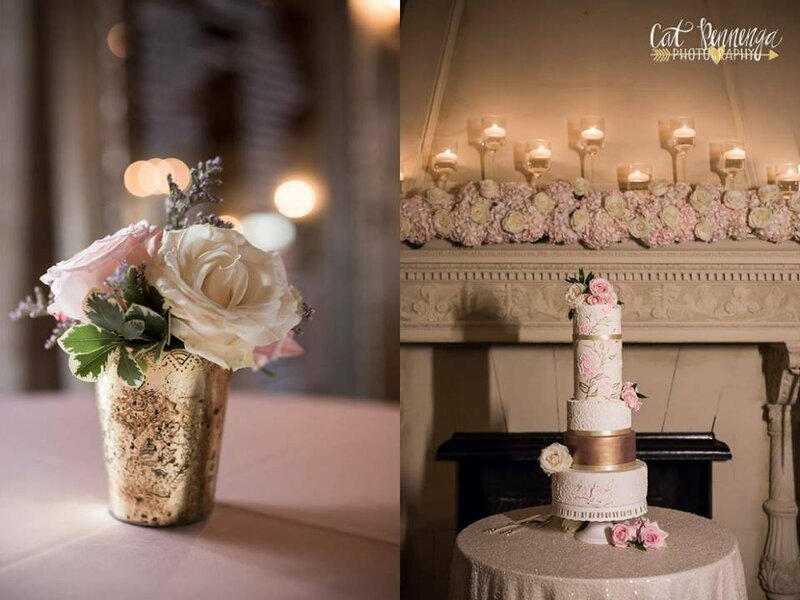 Inside the Powel Crosley Mansion, the mantle held lots of hydrangea and roses with several pedestal glass holders with glowing floating candles. 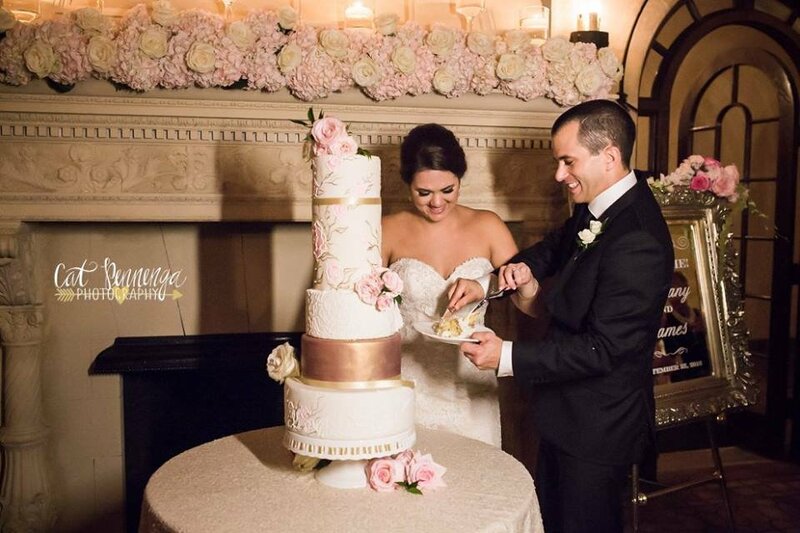 The lovely tall tiered cake from Center Ring Cakes was placed right in front of the mantle. This created such a stunning showpiece! Next to the mantle was the welcome sign (also provided by So Staged!) with a garland 2 floral clusters on it with hanging green amaranths down the sides.